Vancouver, the fourth largest film and television production center in North America, has hosted Hollywood filmmakers from Robert Altman and Dennis Hopper to Jason Reitman and Brad Bird, and is home to independent talent such as Bruce Sweeney and Mina Shum. 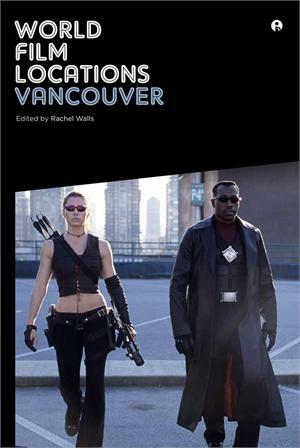 World Film Locations: Vancouver highlights the work of such Canadian filmmakers who have received less attention than they merit, whilst bringing insight into how so-called "runaway" productions from Hollywood use Vancouver to stand in for other locations, from Seattle, USA to Lagos, Nigeria. Analyses of 38 different film scenes reveal the cinematic city in its myriad forms, while spotlight essays provide insight into the creativity and contradictions of Vancouver's film industry throughout the ages. The essays examine the following topics: the masking of Vancouver's indigenous stories in filmic representations of the city; Australian screenwriter James Clavell's Vancouver-set debut The Sweet and the Bitter; Sylvia Spring's Madeleine Is…, the first female-directed feature in Canada; and, Jonathan Kaplan's The Accused, for which Jodie Foster won an Oscar. The volume presents Vancouver's rich diversity and complexity, where magnificent marine and mountain views are both showcased and masked in a number of US television crime series, downtown landmarks provide the backdrop for thrilling sequences, and lesser-known neighbourhoods frame intriguing characters and plotlines. Rachel Walls has been researching and teaching Canadian film since 2007. She has a PhD, from the University of Nottingham, where she also taught Canadian film, television, and literature. She is now Careers Adviser for Researchers at the University of Oxford.